The Reverse-Flash and Zoom have a long and very intertwined history, leaving some to believe the two baddies are the same villain. Here's where that confusion comes from...and how you can tell them apart! While many of Barry Allen’s popular comic book adversaries have already appeared on The Flash, his biggest challenges have been at the hands of two villains—the Reverse-Flash and Zoom. While both characters are speedsters, on the show, they’re pretty different visually and motivationally. However, if you’ve ever tried looking up the two characters in the comics, you were probably pretty surprised and VERY confused. Notice anything? Yes, those are two different characters—characters who look nothing alike on the Flash TV series. And the likely confusion doesn’t end there. In the comics, the Reverse-Flash is also commonly referred to as “Professor Zoom,” or simply “Zoom.” And in some comics, Eobard Thawne is the Reverse-Flash and in others he’s Zoom. So what gives? Why are these two baddies so hard to tell apart? The answer isn’t without its intricacies, but in simplest terms it’s that Zoom, who made his first appearance in 2001, was meant to be something of a new take on the earlier Reverse-Flash, who first appeared in 1963 and was deceased in comic book continuity in 2001. Think Jason Todd and Tim Drake becoming “the new Robin” or Jaime Reyes becoming “the new Blue Beetle.” The character we now know as Zoom was basically the “new Reverse-Flash” for a time. Only for a variety of reasons, that distinction has now become muddied. So let’s take a quick look at these quick heavies and see if we can clear up some of the confusion that surrounds them. To start, it helps to look at two different eras when talking about the Reverse-Flash and Zoom: before The New 52 and after. The CW’s Reverse-Flash, brought to life on The Flash by actor Tom Cavanagh, seems to have been largely inspired by the original Reverse-Flash. This character is Eobard Thawne, a resident of the 25th Century who became obsessed with the Flash, going so far as duplicate the Flash’s powers and traveling back in time to meet the Flash, where he instead learns that he’s destined to become the Flash’s greatest enemy and die at his hands. This shatters Eobard’s already unstable mind, essentially causing him to become the villain he learned about. As mentioned above, Eobard was sometimes also referred to in the comics as Professor Zoom or Zoom, similar to how Batman is “Batman,” “the Caped Crusader” and “the Dark Knight.” At the time, all of these referred to the same character, who was a substantial enough villain within the DC Universe to carry so many names. Eobard would eventually go on to kill Barry Allen’s wife and nearly kill his new fiancée several years later before inadvertently getting his neck snapped by a desperate Flash, bringing Eobard’s initial discovery full circle and paving the way for a new take on the character. That new take would come after Wally West, the third Flash, had inherited the red and yellow mantle. Hunter Zolomon was one of Wally’s closest friends when he learned his father was a serial killer after he murdered Hunter’s mother. Sadly, this would be only the first of several tragedies to befall Hunter. Determined to hunt down vicious criminals like his father, Hunter joined the FBI where he eventually married a fellow agent named Ashley. However, a shootout with a super-villain resulted in the death of Ashley’s father. Ashley divorced Hunter after that, and eventually he was fired by the FBI. He wound up in Keystone City where he joined the police department and befriended Wally. But tragedy struck yet again when an assault by Gorilla Grodd left Hunter with a broken neck. Hunter begged his friend the Flash to travel back in time and prevent the tragedies in his life. When Wally refused, Hunter tried to do it himself using the Cosmic Treadmill, resulting in an explosion that gave him the ability to alter his relative time, making it appear like he was moving at great speeds. His sanity now all but gone, Hunter donned a costume inspired by the Flash’s previous nemesis and christened himself as Zoom. So How Do We Tell These Two Apart? Eobard Thawne and Hunter Zolomon have very similar costumes, so how do you know which one you’re looking at? Of course, you can also use their nemesis as an indicator—the Reverse-Flash was largely a Barry Allen adversary, while Zoom was chiefly a Wally West villain. Finally, there is one easy-to-spot visual cue that you can usually use to tell one from the other. Zoom’s costume covers his eyes, which often appear as red pupils surrounded by ominous dark lenses, while Reverse-Flash’s costume leaves his eyes visible. When DC Comics rebooted their entire line of comics in 2011, some series changed more than others. THE FLASH, which at the time was being co-written by Francis Manapul (who also drew) and Brian Buccellato, saw more changes to the characters than arguably any other series. Just about every villain was redesigned and reconceived, and the Reverse-Flash was no different when he was introduced in 2013. With the resurrection of Eobard Thawne in Flash: Rebirth, it had become difficult to differentiate between the Reverse-Flash (who still had the Professor Zoom moniker attached to him) and Zoom, so The New 52 made the two characters far more distinct. First seen in costume in THE FLASH #22, The New 52’s Reverse-Flash is actually Daniel West, Iris’s brother. 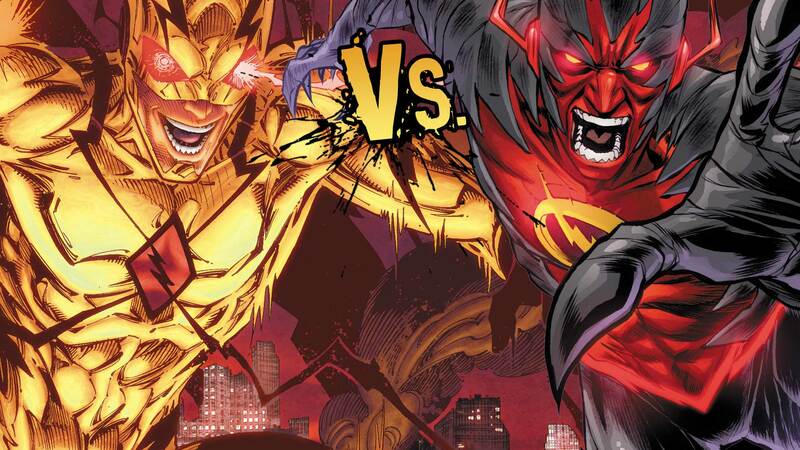 Obtaining his powers through a freak Speed Force incident, Daniel’s Reverse-Flash wears a dramatic black and red costume that looks nothing like the Reverse-Flash’s earlier yellow and red suit. Much like the TV version of the Reverse-Flash, Daniel was ONLY referred to as the Reverse-Flash, never Zoom or Professor Zoom. After his debut in The Flash and eventual incarceration, Daniel would go on to be featured as a member of Task Force X in NEW SUICIDE SQUAD and is now presumed dead. Zoom wouldn’t be introduced to The New 52 until last year’s THE FLASH #40, and his initial storyline only recently wrapped up in December’s THE FLASH #47. This version of Zoom, who also is referred to as Professor Zoom, isn’t Hunter Zolomon, but, yes, Eobard Thawne. Much like the earlier version of Thawne, the New 52’s Zoom is from the future and travels back in time to confront Barry Allen, blaming his society’s admiration of the Flash for their unwillingness to accept his tyrannical rule. While this take on Eobard wears a costume that’s very reminiscent of the first one, his power set is closer to Hunter Zolomon’s Zoom. He manipulates relative time, making it appear that he moves more quickly than anyone else around him, including the Flash. Also, much like Eobard on TV’s The Flash, this version is responsible for the death of Barry’s mother. Considering they look drastically different, it’s a lot easier to tell Zoom and the Reverse-Flash apart now than it was prior to The New 52. Rather, the more important distinction is to remember that Zoom refers to Eobard Thawne after The New 52 and Hunter Zolomon before it. Eobard does wear a costume that’s a lot closer to the prior version of Zoom, but between the diamond-shaped lighting bolt on his chest and the black energy emanating off of him, neither of which the pre-New 52 character had, it’s easy enough to recognize him. So What Does All This Mean for the TV Show? Well, we know who the Reverse-Flash is on The Flash, and now we have two potential identities for Zoom. However, it should be noted that The Flash’s Zoom has some significant differences from any of the comic villains. For starters, his costume looks nothing like any of the comic costumes, most closely resembling Daniel West’s New 52 suit, but not nearly close enough to assume he’s Daniel. Also, this version of the character stems from Earth-2, which is something new. So it’s entirely possible Zoom is someone who isn’t drawn from the comics. Then again, The Flash and Arrow often subvert our expectations, making us suspect that a classic character is being embodied by someone new when in actually it isn’t—like they did last year with the Reverse-Flash and Harrison Wells, who was later revealed to be Eobard Thawne. In short, we can help you identify Zoom and Reverse-Flash in the comics, but when it comes to figuring out who’s behind the mask on the show, you’re on your own! The Flash returns to The CW with an all new episode next week on January 19th at 8 p.m. (7 p.m. CST). You can get caught up on the Scarlet Speedster’s comic book adventures easily by downloading his ongoing series digitally.